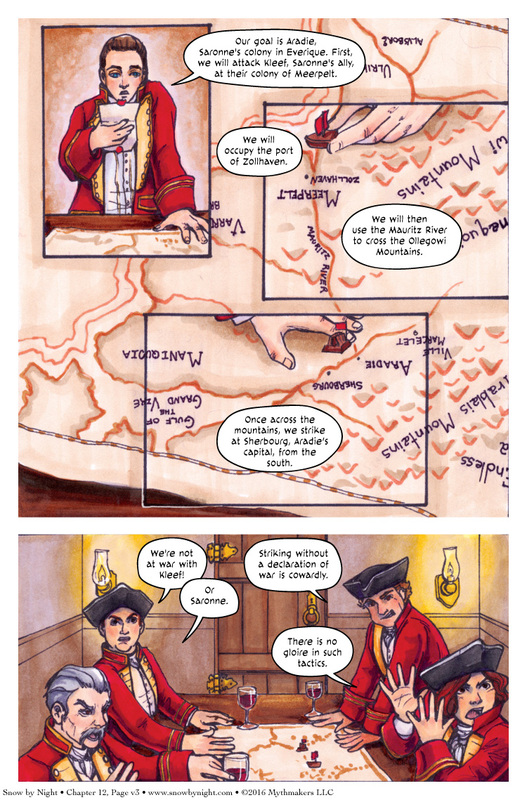 Sherbourg is the ultimate goal of the Morantine fleet in Page 3 of Serpents in the Water. Strangely, General Sayre’s officers are less than enthusiastic. When you vote for Snow by Night on Top Web Comics, you can see Sayre’s answer to their objections. And no, it’s not Game of Thrones so he doesn’t kill them all. Old school warfare – for the gloire of it – versus modern surprise attacks. Most likely the traditionalists will not get the upper hand. Modern and surprise can be combined, you know. You just need to declare war half hour before attack, with the attack force already on way and with not enough time for the defender to mobilize properly. The most important part of it is to schedule the declaration properly. Not mix up timezones, account for time spend on decoding the message … it would be pity if the declaration arrived half hour AFTER the attack. Unless you actually meant it that way, like Japan on December 7, 1941. A big problem with surprise attacks is you earn a long term bad reputation… everyone else will more likely gang up on you because they know you might surprise them later. In a world of only 2 superpowers, surprise is more likely to work, when you have 4+ different superpowers, may backfire long term. Are they taking the fleet over the mountains? That seems like a difficult portage, even in summer. In actual history a lot of warfare between rival colonial powers went along the Hudson River, Lake Champlain, Richelieu River route. In that era canoes & portages were required to by pass rapids in the rivers & cross the divide between Lake Champlain & the Hudson River. In the 19th century dams locks & canals made the route navigable for modest sized steamboats.